One common spam prevention technique may result in you not being able to send email normally when you're traveling. I'll look at why this happens and what to do. Leo, I am a Charter Cable customer and as a result, I have a charter.net email address. I travel every week, and when I am away from home, Charter's email will not let me SEND email when I use Outlook. I can receive email all day long using Outlook when I'm off the Charter ISP, I just can't send any email. Now, using my iPad, it works just fine! But using my laptop? It's a no-go! I have questioned Charter about this several times and each time, I get a canned response from them and they want me to jump through hoops. They know doggone good and well that it isn't going to work, regardless of what I do. 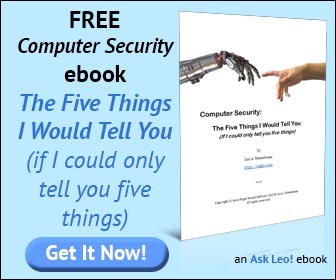 I have a sneaky suspicion that it has something to do with their nasty, ugly, user-unfriendly web-based email system! I downloaded Thunderbird after reading your newsletter, but that didn't work either. Have you got any idea of a setting or something of that nature that I can adjust/change that might make my Outlook work with my Charter email address when I am away from my home base? When your email program sends email, it need to be "authenticated" with your ISP somehow first. Unfortunately, the specific settings that you need will vary from ISP to ISP, and that means that you'll need to go to your ISP for the information. Normally, these settings are described in a knowledgebase article or FAQ, because this really is a frequently asked question of any ISP. 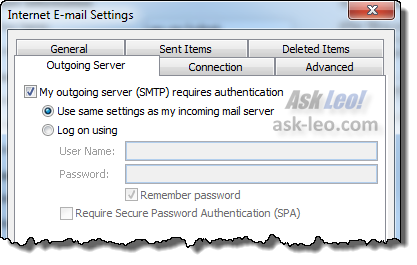 The settings relate to the email program's SMTP (Simple Mail Transfer Protocol) settings. Receive before send - When your email program receives or downloads email, it must first login as you to tell the server exactly whose email is being requested. "Receive before send" tells the email program to check for new email before sending. The email server can then say, "Oh, you just checked for email, so it must still be you. I know who you are; go ahead and send." Authenticate to send - The connections that your email program uses to send and to receive are two completely separate things. As a result, the server may not be able to associate the receive that your email program just did with the send that it's about to. "Authenticate to send" causes the email program to sign in first before sending email, just like it does when receiving. That proves that you're a customer of the ISP, and the mail server then lets you send. These settings are typically buried in the account configuration in your email program. In Outlook 2010, for example, click File, Account Settings..., click the email account in question, and click Change.... In the resulting dialog, click More Settings... and then the Outgoing Server tab. Other email programs will have this setting in different configuration-related places. As I said, which of those two options that you need will depend on your ISP, but they are both designed specifically to allow ISP customers to send email using their ISP's servers from anywhere. The default "port" used to send email is port number 25. Unfortunately, port 25 is often blocked, or worse, hijacked by hotels and other businesses that provide internet connectivity - once again in order to prevent spam. Why can't I send mail from my hotel room? talks about this in more detail, but the bottom line is that if your ISP allows you to use a port other than port 25 to send email, use it. You can use it regardless of where you are, whether you're at home or on the road. First, realize that anyone can connect up to your ISP to try to send email. And, of course, that includes spammers. The send attempt is via an ISP-provided connection. For example, your ISP provides the connection to your home, so they know that it's you or someone at your home sending email. The send attempt is trying to send to a customer of the ISP. In that case, the ISP accepts the email regardless of where it comes from so that it can be delivered to that customer. The send attempt is made by an authenticated ISP customer. As we saw above, authentication allows the ISP to know who's sending. The send attempt is not via a connection provided by the ISP, not by an authenticated ISP customer, and not destined for a customer of the ISP. In other words, the email looks like it's "just passing through", having nothing at all to do with any ISP's customer. Left unchecked, this is one way that spam propagates. There's no one in that path that the ISP can trust - sender or recipient. By configuring your email program to authenticate first in some fashion, as described above, the ISP knows that it's you and thus, they can trust that you're not a spammer (or they can yank your account if you are). Most email service providers like your ISP support this ability to authenticate in some fashion before sending. It's sometimes the case that they might not. In a case like this, I'd be tempted to find another email provider for everything. More practically, you can send using a different service than the one that you receive on. Gmail is often good for this if you have a Google account. It's easy in concept (just configure the SMTP settings for the other service), but sometimes there may be ramifications; it's easy to get the "From:" address wrong on the email that you send and your Sent mail may not be saved as it was when sending through your ISP directly. Whenever possible, it's still probably a good idea to send using the services provided with your email account. Why can't I send mail from my hotel room? Spam may be to blame if you can't send email from your hotel room. How do I route my email through Gmail? Gmail can be used to handle email for just about any email address, even non-Gmail addresses. I'll show you how, and why it's worth considering. What does "relaying denied" mean? "Relaying denied" is an obscure error you may receive in a bounce message. We'll look at what relaying is, and why it might be denied. I used to use a service called mail to web or web to mail -it's been awhile- and it allowed you to tie all your email programs into it, both from your ISP and your web mail accounts. It was handy but the one issue with it was when I downloaded mail with it, the emails stayed in the inbox of the program. If I needed a record of something on my home PC in its Outlook I had to remember to forward copies back to myself. It wasn't that big a deal- just tedious. I use all my ISP allowed email accounts, some 5 of them, and each has specific uses. One I wouldn't use with the web to mail so I wouldn't keep receiving the same mails again. Of course, you can also check the 'leave a copy on my ISP server' but that can create other issues if you forget to clear it or you get a lot of email and fill everything up. I'm sure there are other modern programs that are available that have that all worked out. I know my ISP currently has a service where you can check your mail, both send and receive it, through their web site. I regularly commute between Hong Kong and Manila and when doing so had to go through the process of reconfiguring my outgoing addresses in each place. I now use the SMTP2GO service. I set this as the outgoing server for all my Outlook accounts and can send using outlook from anywhere. So far (2yrs) it has been trouble free and 'set and forget'. This isn't something like the Verizon Port 587 convention, is it? If I use the default Port 25, I can't send from anywhere off the Verizon network; they sent out the "Port 587" fix a couple of years ago. I would hope that Charter would tell you if they did something similar. I have the opposite problem with Charter. I can send from my laptop when on the road (I use Outlook), but can't get my mail to view on my iPad. I can get into my account, but it won't load past the first screen. That happens at home with WiFi as well. This is one of the frustrating aspects of being a Charter customer. Would be less of an issue if their webmail page wasn't such an archaic, slow, ad-heavy pain-in-the-arse. Why do they subject their paying customers to this? Currently I'm staying in Vietnam. Got some big headaches using the free wifi here, because I couldn't send out my urgent emails to my German clients. Like my previous poster Duncan, I'm using Smtp2go ( reference : http://timreviews.com/cant-send-mails ). So far everything works smoothly..finally.